Some Aspergillus species cause serious disease in humans and animals, and can be pathogenic. The most common causing invasive disease are Aspergillus fumigatus and Aspergillus flavus. Aspergillus flavus produces aflatoxin which is both a toxin and a carcinogen. The most common causing allergic disease are Aspergillus fumigatus and Aspergillus clavatus. Aspergillosis is the group of diseases caused by Aspergillus. The most common cause is Aspergillus fumigatus. The symptoms include fever, cough, chest pain or breathlessness. Usually, only patients with already weakened immune systems or who suffer other lung conditions are susceptible. Allergic bronchopulmonary aspergillosis or ABPA (affects patients with symptoms that produce significant respiratory morbidity such as asthma, cystic fibrosis and sinusitis). Acute invasive aspergillosis (risk increases if patient has weakened immunity such as some AIDS patients and those undergoing chemotherapy). 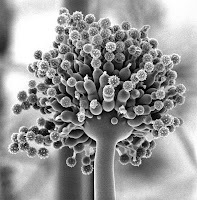 Disseminated invasive aspergillosis (widespread throughout the body). It includes case studies, diagnostic tips, scientific information, medical information, teaching tools (vedio clips, image bank, presentations), ect., on Aspergillus with free registration.